Wired headphones provide you with a tension free music listening experience without needing to charge the device often. While it is certainly comfortable to use a wireless headphone, the quality of sound is often better on the wired counterparts as the signal loss due to interference is significantly lower. True audiophiles with a fixed budget in their mind will find this article on the best wired headphones under Rs.10,000 to their liking. We have done extensive market research to bring you the best ones out there. Trust us, you’ll like it. Grab a cup of coffee, sit tight and let’s start! NOTE: If you are looking for wireless headphones (Over the Head), go through our list of best wireless headphones under Rs.10,000. Beyerdynamic is a German company specialized in manufacturing headphones, microphones and other wireless audio systems. The DT 770 PRO from Beyerdynamic is a premium budget wired headphone which comes equipped with many of the features that have been backported from the expensive and luxury headphones from the company. The Beyerdynamic DT 770 PRO has its frame made of metal. The structure feels very rigid and durable and is ergonomically designed to ensure comfort. The earpiece casings are made of high-quality polycarbonate plastic. This reduces the reverberation effects inside the acoustic chamber and provides clean audio output. The headband is very comfortable and has a smooth leather padding cushion that eliminates any sort of wear fatigue that might occur if you’re to wear this headphone for an extended duration. The headband size adjustment is decent and can be easily done single-handedly. The single-sided cable is sufficiently long. It feels strong and won’t snap easily. The company has also included a quarter inch jack adapter if you wish to plug this headphone into an amplifier. The Beyerdynamic DT770 Pro features a 40mm rare earth magnet driver with exceptional frequency response range to cover all the possible tones that were recorded at the studio. The frequency spectrum ranges between 5 – 35,000 Hz, giving you the same studio experience right from your couch. The deep bass and extreme highs complement each other very well and with the clean and crisp vocals to the mix, the sound output from this wired headphone will make you fall in love with it. Beyerdynamic offers the DT770 Pro in three different variants, the one with 32 Ohms impedance is what we are discussing here, which is the best choice for listening through smartphones. If you own an amplifier and want to listen directly from it we recommend either the 80 Ohm or 250 Ohm variant. The Beyerdynamic DT770 Pro features the company’s patented Bass reflex technology which reduces the reverberations inside the acoustic chamber for better and clear bass response. The earcups and headband cushions can be easily detached and cleaned, meaning the headphone will remain fresh as new if you actually care to clean it periodically. With the Beyerdynamic DT 770 Pro, you get to enjoy the best build quality and the German technology prowess that results in excellent audio quality across different genres of music. The wearing comfort of this headphone makes it suitable for long-term listening without any ear fatigue or discomfort. Audio-Technica products have been some of the common entrants to our best buying lists, be it headphones or earphones. The Audio-Technica ATH-M50x is an over the ear wired headphone that focuses on delivering studio-quality sound output to the masses. The moment you wear this headphone around your neck, it will feel like you’re a professional grade audio enthusiast. No joking – these wired headphones have an attractive eye-catching design with a personality bound to it. The M series headphones from Audio-Technica are acclaimed for the pure performance metrics and this product never fails to deliver the same. The build quality is awesome and the attention to detail is exemplary. The left and right markings are clearly designated to leave no room for confusion while wearing these. The contoured ear cups are comfortable and it fits accurately minimizing the noise bleed to the exterior. The fully foldable ear cups make this a much more compact product that can be tucked into tight spaces easily without any damage to the internals. Being the successor to the original M50, Audio-Technica has the right recipe in terms of excellent sound output here. With the M50x, the recipe is further enhanced to deliver an even better sound (does that even sound right!). The 45mm drivers provide excellent studio quality output without compromising the crispiness and clarity of neither the bass nor the treble. This wired headphone is characterized by the rich deep bass, balanced and natural mids along with the very well detailed highs. The company itself markets this product as studio monitor headphones as the sound signature from this headphone matches to that of other products used in the studio such as the Marshall’s. This wired headphone comes with detachable cables. The box pack includes three separate cables that vary in length and form factor. A 1.2 m rounded cable, a 3 m rounded cable and a 1.1m coiled cable is available that can be used with this headphones. There is no need for a separate amplifier to listen to the music in its full glory with this headphone. The closed-back design minimizes the audio leakage and ensures an immersive listening experience. The Audio-Technica M50x is a studio-grade monitoring headphone that delivers one of the best balanced sound output in headphones priced under Rs.10,000. The robust build quality and the professional grade accessories make it a wiser choice to invest your money if you’re after an audiophile grade headphone. The Sony MDR-10RNC is one the cheapest over the ear headphones in the Indian market which comes with the Active Noise Cancellation (ANC) feature. If you are the one who loves to have a ton of value-added features on your gadgets, this headphone might be an interesting choice worth giving a shot. The MDR-10RNC has a minimal design but we felt this form factor is more attractive than the other headphones in this list. The pressure relieving faux leather ear pads is one of the unique aspects of this wired headphone. The soft texture that fits snug on the earlobes offers utmost comfort and minimal sound leakage to the exteriors. Usually, headphones come with a frequency spectrum that ranges from 20 – 20,000 Hz. But with the MDR – 10RNC, the response range starts as low as 3 Hz. Active Noise Cancellation is a premium feature found only on luxury headphones and earphones. Headphones with ANC enabled does feature a specialized circuitry inside with a couple of microphones to capture the background noise and negate it to provide you with a serene and calm music listening experience. ANC works well on this device and lets you listen to your favourite tracks even when you are in the middle of a noisy crowd. The 40mm neodymium driver along with some clever hardware design makes this possible in the MDR-10RNC possible. The air vent design on the back of the earpiece ensures that the airflow is not hindered while the bass is being delivered to the ears. This reduces the reverberation effect and maximises diaphragm efficiency. If you want a premium budget headphone with active noise cancellation, the Sony MDR-10RNC is currently the best bet for you under a budget of Rs.10,000. The solid build quality, excellent sound output and the reliability of the brand such as Sony make this purchase well worth your hard earned money. The Sennheiser HD 4.30G is a premium quality wired budget headphone with an around the ear design which aids in superior acoustic performance. This device comes with a fully foldable headband and an inline microphone to attend voice calls on the go. The Sennheiser HD 4.30G is made entirely of high-quality polycarbonate material. This makes the device partly flexible and lightweight. The headband is sufficiently cushioned and has a smaller size footprint. Another fact to note about this headband is that it is completely foldable. This makes the Sennheiser HD 4.30G the compact and portable wired headphone in its price category. The sufficiently large earpiece has comfy pads over them to give a closed back audio experience. The cable on this headphone is rounded but tangle resistant. The Sennheiser HD 4.30G is powered by a 40mm speaker driver custom made by the company for enhanced performance. These speakers have been carefully tuned to perfection for delivering exceptional quality music. One of the USP of this Sennheiser wired headphone is its 18 Ohm impedance rating. This means the driver only has to overcome the least resistance for producing sound. The low impedance factor significantly boosts the performance of this budget headphone when used with low-end Android smartphones without a dedicated DAC. The bass is adequate and the quality of mids and highs are very good on this device. This headphone comes with a single button remote and an excellent microphone. The mic is so sensitive to the user’s voice and somehow manages to isolate the background noise to an extent, providing you with the best possible voice quality in the segment. The Sennheiser HD 4.30G is an excellent purchase for those who are looking for a capable and affordable pro-quality headphone to use with their smartphones. The pleasing audio output and the built quality along with the in-line mic for voice calls makes it an all-round performer in the sub. Rs.10,000 price category. Razer is a company known for its laptops and gaming accessories. The company has a loyal fan following in India and abroad, thanks to the cutting edge technology in these products which deliver a better gaming experience to the users. 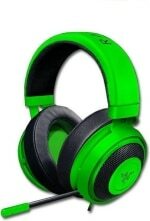 The Kraken Pro V2 from Razer is a wired over-the-ear headphone designed specifically with gamers in mind. The Razer Kraken Pro V2 has the signature green colour which comes standard with almost all Razer products. The use of high-quality materials for construction justifies the price tag of this premium gaming headphone. The plush cushions feel good to wear during long hours of gaming sessions so does the headband. Full ear coverage of the cushion means excellent noise isolation, which is paramount for a gaming aficionado. The cable is Kevlar reinforced and comes with an inline remote. The Razer Kraken V2 Pro comes equipped with large 50mm drivers to deliver excellent quality sound output. These drivers cover a wide frequency response range of 12 – 28000 Hz to provide a rich surround sound experience without missing any musical notes. The vocals are crisp and clear so does the bass and the treble. You’re guaranteed to experience an immersive gaming experience with this headphone. The inline remote control on this headphone comes with a volume slider and mute button. The unidirectional microphone works well to capture the sound. Razer provides one-year worth of warranty with this device to cover any unfortunate mishaps if it occurs. If you’re a gaming fanatic and looking for a premium headphone to spice up your gaming endeavour, Razer Kraken Pro V2 is a must-have in your kitty. Sennheiser needs no introduction in the Indian market, thanks to the multitude of excellent earphones and headphones which received popularity among the general public. Sennheiser HD-280 Pro is a studio quality wired headphone which comes with a very comfortable fit and form factor. The Sennheiser HD-280 Pro is one of the ergonomically designed headphone crafted with user comfort in mind. The monotone black finish looks minimal yet elegant. The use of high-quality plastics for construction makes the headphone feel durable and solid. Earcups are foldable and the adjustable headband offers different step sizes to make it fit snug on your head. The use of unconventional raised cushion of the headband makes sure the comfort remains the same for hours. Single-sided cable ensures that there is no disturbances or distractions while listening to music when you are on the move. The Sennheiser HD 280 Pro comes equipped with 40mm neodymium magnet drivers. These custom tuned drivers deliver excellent tonally rich and balanced sound profile which will suits all kinds of music genres equally well. Sennheiser HD 280 Pro covers a wide frequency spectrum of 8 – 25,000 Hz, which is sufficient enough for a studio-quality listening experience. The only drawback of this wired headphone is the high impedance count of 47 Ohms. It means the power needed to utilize the maximum potential of this headphone is higher and budget smartphones might show some degradation in audio performance with this device. Ambient Noise Isolation (AMN) is Sennheiser’s pet name for its noise cancellation technology. The HD 280 Pro features AMN up to 32dB. This means the headphone can block sounds up to 32dB from getting inside the ear canal. AMN ensures a calm and contempt music listening session when you’re outside. The Sennheiser HD 280 Pro is a comfortable, over the ear wired headphone which has an excellent active noise cancellation feature to back up the performance. The ergonomic design and the wearing comfort also makes this headphone worth finding an entry in our list of best headphones priced under Rs.10,000. This concludes our list for the best wired headphones available in India under a budget of Rs.10,000. If you find the budget a little over the top, we suggest you check out the best wired headphones under Rs.5,000 article for more affordable choices. If you have any suggestions or ideas that might improve this article, don’t hesitate to share with us in the comment section below. Thanks for visiting the site and return soon!